The Regional Ministry of Culture and Tourism begins the commemorative events for the 25th anniversary of the inclusion of the French Camino in the tentative UNESCO World Heritage List. The celebration will include various events and initiatives not only in Santiago de Compostela, the destination of the pilgrimage, but along the Camino de Santiago. Thus, from this Wednesday and until the 11th, close to a dozen monuments of the Jacobean Route will illuminate to join this celebration. All of them will change their usual light installation and will bear the characteristic colours of the Camino de Santiago. 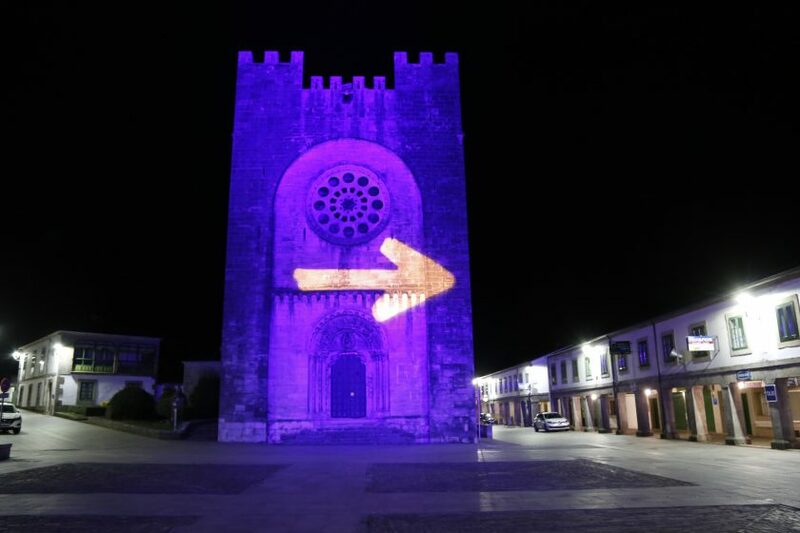 Every night for six days, they will be lit up in blue tones and the popular yellow arrow will be projected onto them, the symbol that guides the pilgrims in the different itineraries and that was key in the contemporary recovery of this phenomenon. This special event will take place in several of the most emblematic monuments of the French Camino, in different municipalities, making the commemoration global. In particular, it can be seen in the church of Santa Maria a Real do Cebreiro, in San Salvador de Sarria, in San Nicolas de Portomarin and San Pedro de Melide. In addition, in the capital of Compostela, the Capela de Animas chapel, the church of San Bieito do Campo, the tower of the Berengaria of the Cathedral, on its façade of the plaza de Praterías square, and the Hejduk towers of the Cidade da Cultura will be lit up. Galicians and pilgrims can also participate in an anniversary that marked a before and after for the Camino de Santiago, until its current dimension and recognition, as one of the most universal pilgrimage routes that decisively contributed to the protection and preservation of its heritage and the socio-economic development of the Region.